Brookwood Horticulture traces its roots back to 1985 when it was entirely comprised of only two greenhouses and a small tree farm. With only a handful of willing teachers, the team trained citizens to transplant donated plant plugs into pots. While only successfully growing about 10% of those plugs initially planted, Brookwood Horticulture stayed in the fight and has grown exponentially since then. Today, the Horticulture enterprise grows approximately 300,000 plants a year in 47 greenhouses, employing nearly 100 citizens every single day. Suffice to say, it’s been a wild success. Our horticulture department produces approximately 37,000 Poinsettias each year. The citizens plant 25,000- 30,000 plants a week, depending on the season, in our Planting and Propagation Shops. We propagate ~50% of the plants grown at Brookwood and produce a variety of perennials, bedding plants, hanging baskets, and poinsettias, as well as special orders for wholesale and retail trade. Propagation Team – The Propagation Team is our smallest, yet most specialized team. Citizens on the ‘Prop Team’ pull plants to be propagated, make cuttings, and replant into new containers. Plant Shop Team – The Plant Shop Team has the broadest variety of work by far. From filling new pots with soil to planting in new plugs to watering in the new plugs, the Plant Shop is always a whirlwind of activity! Movers – Without our Moving Team, our greenhouses would be so crowded and disorganized, the Horticulture Department would cease to function. 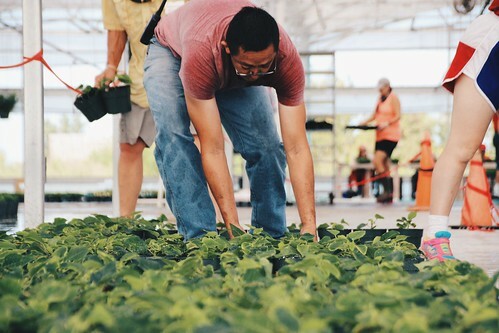 The Movers move plants from greenhouse to greenhouse, reorganize and consolidate crops, and remove plants that no longer meet our high standard for quality. Project Green – Project Green is Horticulture’s newest venture! Employing some of our citizens requiring more one-on-one attention, Project Green works to build independence and provide a more relaxed environment for citizens to learn basic functions needed to be a contributing member of the Horticulture team. "The wonderful people at Brookwood Horticulture consistently grow the most beautiful plant material! Their quality is the best there is and it is always a pleasure doing business with them. They are #1 in their field!!!"